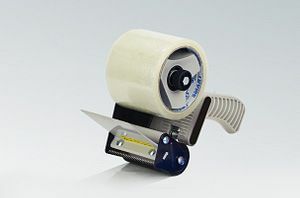 A device for manual application packaging tape. Suitable for tape up to 75mm wide. It has a cutting blade with a pressure pad and an ergonomic handle with adjustable brake roll. Additionally, the device allows you to adjust belt tension. Is suitable for household, office and warehouse.